Just a couple of points on the quality of this product. Firstly, my pasty was a bit black on the side as the edges had been burned and as you can see in the pic, the contents are surrounded by a wide gap in the pastry. Anyways on to the taste test. As with most pastry items this pasty was quite greasy and the taste when you bite into it warm almost tastes like a weak cheese and onion pasty at first(maybe because of the burnt edge) and then as you get more central to the contents you get a bit more pasty flavour but I have to say its quite weak and bland. 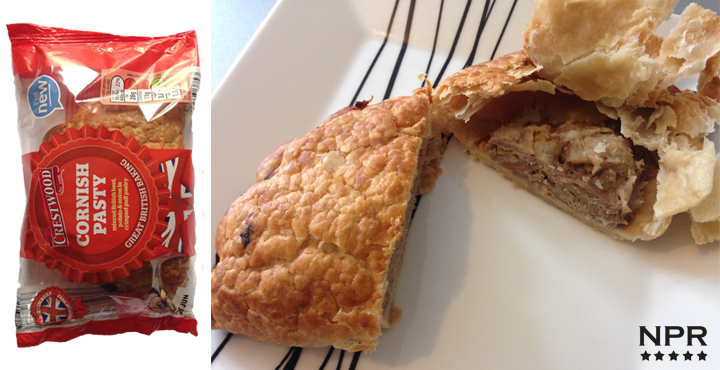 These is no strong flavours that you associate with a Cornish Pasty and the pastry doesn’t do much to help either. Overall it just seems like you’re eating pastry with a bit of flavour instead of the other way round but it will fill you a bit, but I don’t think you’ll enjoy it more than a Greggs pasty that’s for sure. Overall not something to buy again, save your money for something else at Aldi. Wheat Flour(Wheat Flour, Wheat Gluten, Calcium Carbonate, Iron, Niacin, Thiamin), Beef(20%), Potato(18%), Water, Palm Oil, Swede(8%), Onion(7%), Beef Fat, Salt, Palm Stearin, Maize, Starch, Egg Glaze(Water, Dried Egg), Cracked Black Pepper, Yeast Extract, Rapeseed Oil, Demerara Sugar, Flavouring, Lemon Juice, Malted Barley Extract, Onion Powder, Black Pepper. How can they call that a Cornish Pasty? It looks absolutely disgusting and look at the ingredients, they have no idea how to provide a tasty pasty without adding a load of extras that a true Cornish Pasty has and they even fail at that. What an insult to the true Genuine Cornish Pasty! They’re not even made in Cornwall, so they are illegal copies and should be removed from Aldi shelves. Hi, I totally agree, I have had the pleasure of having a true Cornish Pasty in Cornwall and this product was a poor copy. And you’re absolutely right, with its EU PGI status it is illegal(at the moment)to call a pasty Cornish if its not produced in Cornwall. Undoubtably the worst pastie I have ever tried! When I make a pie I do not say underneath it there might be peanuts in it because some people can’t eat peanuts. Change the mixers and clean them after use then this will not happen. Aldi new pasties are not a patch on their previous “Traditional” Cornish Pasties which were individually wrapped and priced at 49p each. The replacement item is quite frankly disgusting to taste, it lookes like cheap minced meat with added onion, nothing at all like any half decent pasty I have ever had, and, sorry to be repetitive, not a patch on the product its replacing. Its interesting that Lidl did the same thing some time ago, replacing an excellent product with something totally rubbish by comparison. Aldi, you have made a huge mistake!